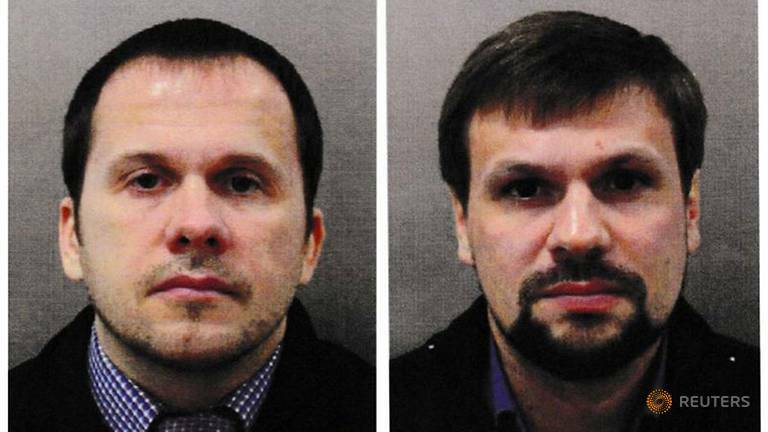 Two Russians resembling men Britain accuses of jetting to England to try to murder a former spy said on Thursday that they were innocent tourists who had flown to London for fun and visited the city of Salisbury to see its cathedral. The duo, who appeared acutely ill at ease, identified themselves as Alexander Petrov and Ruslan Boshirov, the names British prosecutors said were used by the poisoners. They said they had fallen victim to a "fantastical fatal coincidence". Britain has charged the two men with attempting to murder former Russian spy Sergei Skripal and his daughter Yulia by spraying a chemical weapon on Skripal's door in March. "Our friends had been suggesting for a long time that we visit this wonderful town," Petrov said of Salisbury. "There's the famous Salisbury cathedral. It's famous not only in Europe, but in the whole world. It's famous for its 123 metre-spire. It's famous for its clock, one of the first ever created in the world that's still working," added Boshirov reeling off facts that closely resembled those laid out in a Russian-language Wikipedia entry about Salisbury. Asked about the interview, a British government spokeswoman said: "The government is clear these men are officers of the Russian military intelligence service - the GRU - who used a devastatingly toxic, illegal chemical weapon on the streets of our country." A spokesman for Prime Minister Theresa May said the interview was "an insult to the public's intelligence" and "deeply offensive" to the victims of the attack. According to British police, the two men arrived in London on March 2, a Friday, and spent two nights in an east London hotel. They visited Salisbury twice by train on day trips - on the Saturday for reconnaissance and on the Sunday to poison Skripal. They then went straight to the airport and flew home, hours after the Skripals were found unconscious on a bench. "From the very start we planned to go to London and, put bluntly, cut loose and have some fun," he said in the interview which was pre-recorded on Wednesday and broadcast on Thursday. Boshirov said the two men were innocent and denied they had carried the Novichok nerve agent used in the attack. He laughed off as "silly" the idea that they would have carried a women's perfume bottle. They may have approached Sergei Skripal's house by chance, but did not know where it was located, they said. "I'm frightened, I'm scared. I don't know what to expect tomorrow," said Boshirov. "We simply wish to be left alone." Ben Nimmo, a senior fellow at the Atlantic Council’s Digital Forensic Research Lab, called the interview "a piece of political theatre". "It could be a way of signalling defiance to the UK government, effectively saying, 'There’s nothing you can do about this'," he said. A European arrest warrant has been issued for the two suspects, but British prosecutors say they will not ask Moscow to extradite Russian citizens because Russia's constitution forbids it.